Tuesday, April 16, 5 pm – 9 pm at Red Robin, 14599 Clay Terrace Blvd, Carmel. Enjoy one of Red Robin’s delicious gourmet burgers or other numerous tasty menu offerings as you support CaMS. Tuesday, May 21, 2019, 4 pm – 8 pm at Blaze Pizza, 12607 N. Pennsylvania Ave., Carmel. Enjoy fresh, made-from-scratch dough topped with your choice of healthful, artisanal ingredients, baked in a blazing hot oven. It’s fast-fired, perfectly crisp pizza perfection and simple salads, with the added bonus of supporting CaMS students. AND also on Tuesday, May 21, 2019, Noon – 9 pm at Yogurtz, 12561 N. Meridian St., Carmel. Stop by Yogurtz to create your own cold treat with your choice of a number of yummy mix-ins as you support CaMS. 5th Grade Transition Night Current 5th graders and their parents are invited to stop by the PTO table at the 5th Grade Transition Night on Wednesday, April 24th from 5:30 pm – 7 pm to learn more about the many CaMS opportunities and programs. WANTED: Box Tops! Don’t forget to turn in Box Tops, even as we wind down the school year! Parents can bring Box Tops to the front office, or students can turn them in at the bookstore during open hours. (Students can earn one Dum Dum sucker for every 10 Box Tops they turn in at the bookstore.) Donating to the CaMS PTO Thank you to all the CaMS families who have supported the PTO this year! Your donations have helped provide a number of programs & opportunities for CaMS students & staff! To learn more about how the CaMS PTO has used your generous donations to benefit the school, see our social media posts for our “Your Donations at Work” series (https://www1.ccs.k12.in.us/cam/pto). It’s not too late to help support the CaMS PTO. We are still accepting donations! CaMS PTO Pantry Packs The Pantry Packs program provides small meals and snacks weekly to CaMS students who qualify through the counseling department. We are thankful for the support we have received from school and community groups this year. At this time, canned tuna or chicken, macaroni and cheese, applesauce cups, and canned fruit are most in need. Food donations can be dropped off at bins located outside the CaMS main entrance. Financial donations can be made at www1.ccs.k12.in.us/cam/pto. If your club or business would like to host a food drive, or if you have questions, please contact Anne-Marie Monty or Amanda Swearingen at CMSPantryPacks@ gmail.com. Please call before 8:00 AM and select OPTION 1 if: •	Your student will be ABSENT. •	Your student will be LATE. Note: Students must arrive by 11:30 to participate in an extracurricular activity. •	Your student is leaving school EARLY. 5 EASY TIPS TO PREPARE FOR STANDARDIZED TESTING SEASON Help your child become a confident and prepared test-taker. For most around the country, the month of March kicks-off standardized testing season and that can leave parents feeling overwhelmed. Whether you have a grade schooler preparing for the state’s standardized test or a high schooler preparing for the SAT, testing can be stressful for the entire family. We hope this will help you start planning a few months out. There’s no secret formula when it comes to passing a standardized test. It’s important to remember that anxiety may hinder performance for the test taker, so take a deep breath and read through a few practical tips to help your child prepare for standardized assessments. 1. Take practice tests. Many Department of Education state websites offer practice tests, which can help prepare children with understanding the test expectations, including the content and mechanics. SBAC and PARCC give assessments in many states and offer good examples of practice tests. If the test format seems familiar on test day, kids are more likely to feel comfortable and know what to do. 2. Promote a positive attitude. Parents should promote a positive attitude towards learning and testing. Kids need to take tests seriously and be strategic, but also feel confident and mentally prepared. Parents can help children feel prepared for the test by encouraging children to visualize success on test day. In other words, ask children to close their eyes and imagine themselves taking the test and feeling great about it. 3. Discuss what to do if you finish early. Sometimes kids finish the test early. It’s important to discuss that this is a good opportunity to double check and verify their answers for accuracy. Parents can coach them to review certain questions that were hard and use the process of elimination to rule out some of the answer choices. 4. Eat well, exercise and rest. In the weeks leading up to the test, it is important for students to have adequate sleep (eight hours is recommended), eat balanced meals, drink plenty of water, and get exercise. Foods high in protein, and water help to stimulate the brain. Exercise, such as stretching and walking, helps to supply the brain with oxygen. Eating a healthy breakfast before school, particularly on the day of the test, gives the body the fuel it needs to maintain long periods of concentration. 5 WAYS TO GET YOUR TEEN TO TALK TO YOU Because talking to teens requires another skill set entirely. Marie Rossiter ·October 9, 2017 Talking to teenagers can feel like talking to someone from another world. Your formerly chatty child suddenly keeps his mouth shut tighter than the security at Fort Knox. Even simple questions like “How was your day at school?” get a reaction that would be more appropriate to an intense interrogation scenario. And when a teen actually does want to talk, she seems to hear things her own way, or speak in ways her parents don’t understand. 2. Don’t Get Too Emotional If you knew someone was going to explode at you, would you want to talk to her? Probably not. I have had to work on this for many years. Sometimes, when your teen tells you something, you get angry, scared, frustrated, etc. However, it’s important to not fly off the handle during these conversations. Getting overly emotional will only backfire when you want your teenager to share their true feelings. 3. Listen Actively To Your Teen I have a confession. I give my teenaged daughters a lot of grief over how attached they are to their smartphones. Sometimes, I have to say something two or three times before they actually hear me. That gets me pretty ticked off. But here’s the issue: I do the same thing to them. When they ask me something and I’m working on the computer or on my phone, I only half-listen. 1. Don’t Be a Helicopter Parent Want to get your kid to close up tighter than a clam? Hover. I can almost guarantee they’ll never open up. Yes, the world is a scary place and no one wants to see their teenager struggle. But not giving your child the space to make his or her own decisions can backfire, Deborah Gilboa, M.D., parenting expert, told Parents Magazine. In fact, overinvolvement in our child’s life can cause decreased selfesteem, ineffective coping skills and lots of anxiety. I’m trying to be a more attentive and active listener with my girls. I hope that showing them 100 percent focus when they talk to me sets a good example. I still have a lot of work to do in this area, but I see progress. Also, once you put down your gadgets or turn off the TV, make sure you give your teen a chance to talk. Too often, parents like to interrupt to give their two cents. Sometimes our teens just want someone to listen to them. They don’t necessarily need our advice. If we teach our children to fear, how can they feel comfortable talking to us when they have a problem? Many won’t. So give your teen a little space. 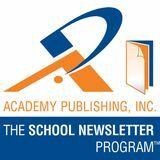 Parents, please let the sponsor advertisers know you appreciate them! ATHLETIC INFORMATION The 2018-2019 winter athletics season is in the books! A few major accomplishments stand out amongst the many successes. Three eighth grade wrestlers won individual county championships and the 8th grade Girls’ Basketball team finished second in the 2019 Hamilton County Basketball Tournament. Well done winter athletes! Baseball, softball and track & field are in full swing! 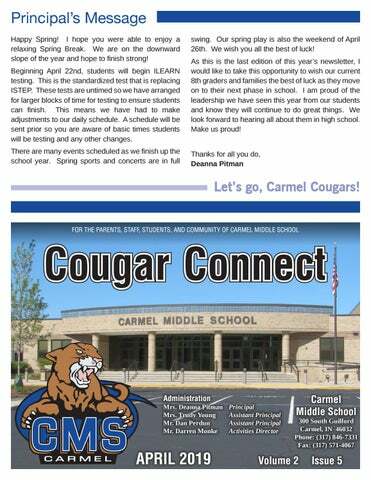 Come on out and support the many athletes representing Carmel Middle School. Schedules are located HERE. To be part of this free program, you must sign your family up no later than March 28, 2019. Please contact Mrs. Peregrin or Mrs. Garber to sign up.